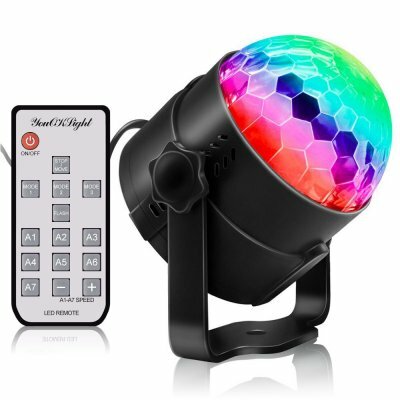 Successfully Added LED Party Lights RGB Lamp Karaoke Light Disco Ball Lights EU plug to your Shopping Cart. Made of hard plastic material, really durable for a long lifespan. 7 Color lighting and 3 mode with remote-music mode, auto mode and flash mode. Really lightweight and easy to use, can be easily installed in the ceiling. Also can put on a table or on the floor. Perfect for home party and great gift for kids, can be used on wedding, celebrations, birthday party, and house. Flash mode: Comes with strobe program, also can adjustable strobe speed.